Croot’s farmshop is grown out of a real passion for home-grown and local food. I first heard about them because they kept coming up as innovators in the World of sausages. They have run sausage recipe competitions, innovated with flavours and even got premiership footballers involved with their sausages. It is companies like these guys, always pushing the boundaries, that I really enjoying hearing about. 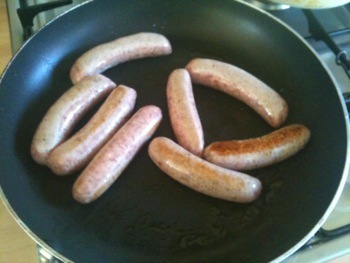 And so to the sausages! As regular readers will know I think you can tell a lot about a sausage maker by sampling his/her “traditional” sausage. Sometimes they call them “original” but to you or I it’s the most simple one. Often this also, very usefully, comes in a chipolata size too. To say the Croot’s sausages are excellent is an understatement. They now have a reputation both in Derbyshire and around the rest of the county and you can see why. They cooked beautifully (on a very low heat which is how I like to fry them) with very minimal loss of weight, no splitting and no fuss. We stuck them in some sandwiches and they were a hit with the whole family. As I’ve been playing with making some videos of some of my sausage exploits we had a bash at putting something together and on youtube.com. Be warned though – it was early and, as my brother always tells me, I have the face for radio! In addition to these “original” or breakfast style sausages they also offer a whole variety of mouth-watering flavours and I am looking forward to reviewing these. I also think I should make it a destination for The Sausage King Adventures – what do you think?